Trade Unions in a Neoliberal World is the first book to provide readers with an authoritative and comprehensive assessment of the impact of New Labour governments on employment relations and trade unions. This innovative text locates changes in industrial politics since the 1990s in the development of globalization and the worldwide emergence of neoliberalism. The advent of Tony Blair’s government in 1997 promised a new dawn for employment relations. In this rigorous but readable volume, a team of experienced and respected contributors explain in detail how the story has unfolded. 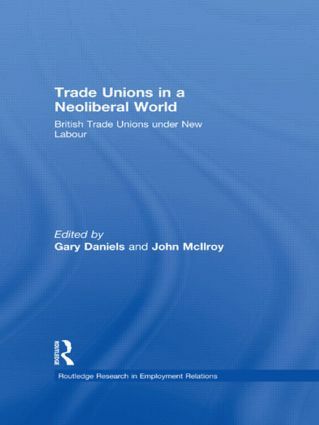 This book looks at all aspects of New Labour’s policies in relation to employment relations and trade unionism. The first half of Trade Unions in a Neoliberal World presents an overview of industrial politics, the evolution of New Labour and an anatomy of contemporary trade unionism. It discusses relations between the Labour Party and the unions and the response of trade unionists to political and economic change. The second part contains chapters on legislation, partnership, organizing, training, strikes and perspectives on Europe. Partnership: New Labour’s Third Way? Skills and training: A strategic role for trade unions or the limits of neoliberalism?